To unlock protected folders, you must supply the correct password. If the password field is empty or the password you entered is invalid, Folder Password Expert will display an error message and the folders will remain locked. If you forgot your password, click the Get a Hint button. Please note that there is no way to retrieve the password if it is lost. If you selected more than one folder to unlock, Folder Password Expert will prompt you for the password for each of the folders. If you fail to supply the correct password, Folder Password Expert will not allow you to proceed to the next step. 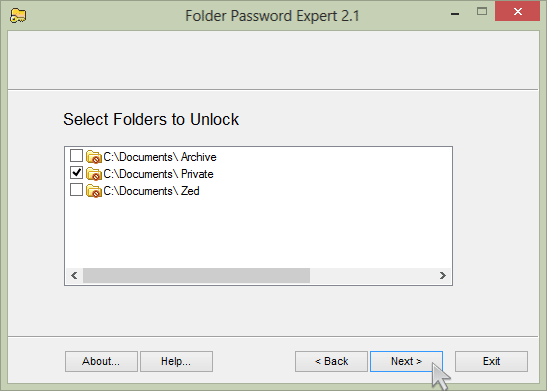 If you don't remember the password for one of the folders but still want to unlock the other ones, close Folder Password Expert, then run in again and select only the folders for which you know the password.